The loose fitting Gorkas are a commonly used by Russia's more elite fighting units. These are not made for the parade grounds, but developed to be purely practical. We sell the trousers and jackets separately. Here's the jacket. These Tactic-9 made brown Gorkas are made of a bit lighter fabric than most others, resulting in a very summery feel. All hard wearing areas are reinforced with a strong polycotton blend, either ripstop reinforced or not, this varies from one pair to the other. Our model is 175 cm tall with a chest circumference of 98 cm and wears size 48-4 (176 / 96) garment. There's plenty of room for warm stuff underneath. 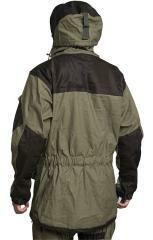 Nice lightweight Gorka jacket. Picked the 50-3 size - fits over a fleece and smock combo (UK 170-104 size) without binding, and not overly baggy when worn by itself. 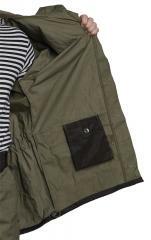 It has good front pockets, but the sleeve pockets sit on the bicep more than the side of the arm and can interfere with simple arm motion when reasonably filled (wallet, cellphone). Looks good and is "old clothes" comfortable. But, buy this a bit bigger than you need because it is made of light canvas and will shrink when washed, even if you use cool water. Mine is now a little too tight when a fleece is worn under it. Now that I have used this a short time I have had 4 out of the 8 front buttons come off or unravel. I will need to redo all of them or risk loosing them. Good. Tough material. Good looking. I'm 6'2, 13 stone. Went for the 56/6 and it's a little bit large on me. As a kid in Scotland I remember having something a bit like this, which I'd wear when out on the hills or in the woods. 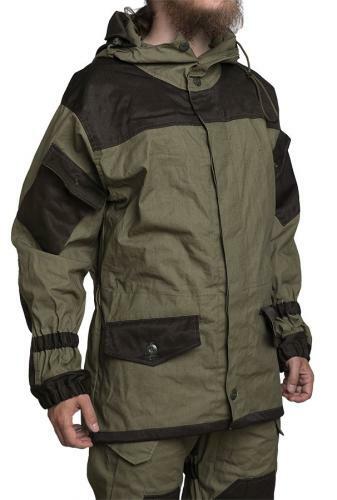 Simple and sturdy and surprisingly weatherproof, I reasoned that there must be a good reason for jackets like this to still exist. I use this jacket for nature photography, and wanted one slightly large so I could tuck my camera inside. As an added advantage, the longer sleeves accommodate my hands meaning I use fingerless gloves so I'm always ready to take a pic (done at -2 Celsius). 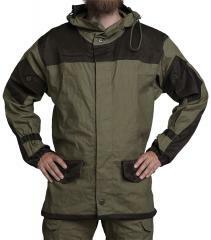 In terms of performance: this is not sold as waterproof so I wanted to test its abilities in a range of weather. So, 5 degrees and 20mph wind, slight shower: no problem. It keeps everything off (worn with t-shirt and fleece hoody). At -2, fairly calm but with a sea-breeze, worn with t-shirt, fleece hoody and loft jacket, absolutely toasty. At +2, driving rain blown straight off the North Sea at 20+mph, worn with t-shirt, hoody and soft-shell jacket, the gorka did a great job. Having tucked my camera inside the jacket I hung around on the beach collecting fossils in some pretty foul weather. Even when wet the wind didn't impact me at all, and between the gorka and soft-shell my core layers were bone dry. For my use this is a brilliant bit of kit. Crawling about, walking, using the longer back (because of the size I got) as a bum warmer to sit on cold rocks. I intend to add a bit of velcro between the buttons for quicker access, mainly for my camera. I'd never consider doing that with a £200 jacket, and that's another beauty of the gorka. Oikein näppärä takki joka suojaa ohuudestaan huolimatta viileältä tuulelta ja sateelta, kunhan alla on sopiva kerrasto. Sopii niin kylmille kuin lämpimillekkin keleille. Ainoa haittapuoli on heikosti ommellut napit, joten kannattaa varautua ostamaan varanapit sekä lankaa; itseltä kaksi irronnut normaalikäytössä. Oikein mukava nuttu, vaikka ei mikään supervaate olekaan. Taskuja saisi toki olla enemmän nykyaikana. Kokotaulukko pitää kutinsa. Valmistajan mukaan kangas on sekoitekangasta ja tyypiltään Rip-stopia joten siitä kankaan ilmavuus johtuu.
" Rip-Stop weighing 240/260 grams / meter square. 57% hb 43% p / e .; Mixed weighing 210/220 grams / meter square. 35% hb 65% polyethylene"
Käyttöön se ei juuri vaikuta , mutta on harhaanjohtavaa antaa ymmärtää tuotekuvauksessa tämän olevan puuvilla-telttakangasta kun se ei ole. Itse takki on muuten varsin mukava kuoritakki. Napit on syytä kiinnittää tukevammin kuin tehtaan jäljiltä ovat. edit: nyt napit on kiinnitetty kunnolla paikalleen ja käyttö voi alkaa kuten housujenkin. Bongasin takin helmasta mainion kirsityssäädön jolla helman lerpatusta on helppo minimoida . Kaiki napit olivat siis koneommeltuja ja irtoavat varmasti tehtaan jäljiltä. Just received mine yesterday. It's not heavy, and you can layer underneath! Just wish you had the pants for this!